The $99 phone has a claimed battery life of 15 years without recharging, if you don’t turn it on, or ten hours of continuous talk time if you do. 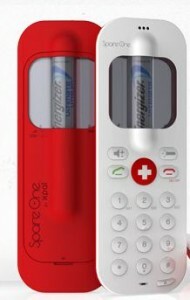 It works on a single double-A battery. The point is to keep it in your car’s glove box for emergencies. It has a red button that calls 911, even, they say, if you press it for the first time 15 years later. If you want to use the Spare One as a regular phone, though, you need to buy a “sim card” from a cell phone service provider. The cost for that will depend on the contract. The lowest we could find was around $35 a month from Virgin Mobile; they let you go month to month.